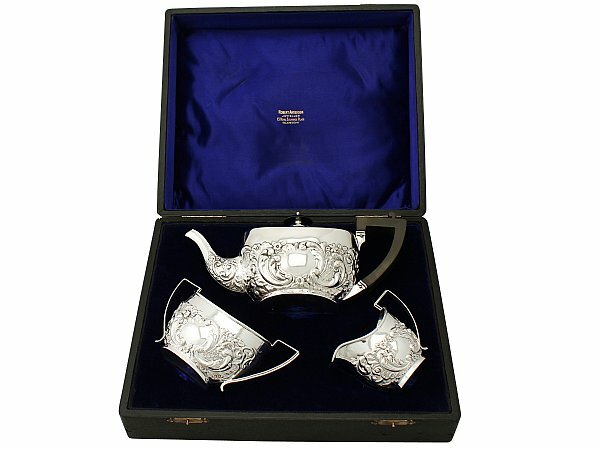 This impressive antique sterling silver three piece tea set / service consists of a teapot, sugar bowl and cream jug. Each piece of this Victorian tea service has an oval rounded form. The body of the teapot, cream jug and sugar bowl are embellished with embossed scrolling leaf and floral ornamentation accented with panels of trellis textures. The decoration to either side of each piece incorporates a shaped vacant cartouche accented with a large scrolling leaf decorated border. The teapot is fitted with a domed hinged hallmarked cover, which features further embossed floral and foliate decoration. The cover is surmounted by the original carved painted wood and sterling silver cushion shaped finial. This antique Victorian tea service is fitted to the original hinged leatherette box with satin and velvet lined interior, securing with two hinged catches. The interior of the box bears the retailer's mark 'Robert Anderson, Jeweller, 13 Royal Exchange Place, Glasgow'. 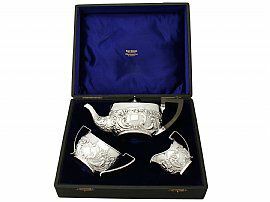 This antique tea set is a very good gauge of silver, excellent quality and in exceptional presentation condition. The interior of the each piece has been professionally cleaned and is ready for use. Full hallmarks struck to the surface of each piece are clear in keeping with age and location. Reflections in photographs may detract from the true representation of these fine examples of Victorian silverware. Length from back of handle to tip of spout 24.1cm/9.5"
Length from back of handle to tip of lip 10.6cm/4.2"